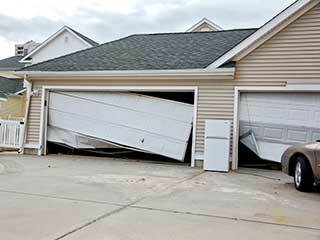 It's never fun to realize your garage door isn't working correctly. Usually, it happens in the least convenient moments, like when you're in a hurry to leave for work, or when you're tired and want to park your car for the night. This automatic door system consists of different electrical and mechanical components, and the range of problems that can affect it is quite extensive. However, our experts are happy to let you know that you can always count on us for a solution. One of the most common and most annoying and dangerous problems a garage door can suffer from is a broken spring. This component is what helps the mechanism move with relative ease, whether automatically or manually. The springs are under a lot of tension, and trying to replace them yourself is a big mistake. One wrong move and they can whip around and cause severe lacerations. It's much safer to avoid these potential risks and to simply let our experts handle things safely. The motorized unit that controls and powers the automatic movement of your door can be a source of problems, unfortunately. Of course, models made by reliable brands like LiftMaster, Genie, and Chamberlain are far less likely to start acting up, but there's still a chance, especially the older they get. The motor gears can break or wear out, leaving the unit unable to move the door. The circuit board can glitch or fry due to one too many power surges, causing the opener to behave erratically, or to not work at all. Even the safety sensors, who serve such a crucial role, can lead to issues when they become misaligned or if their lenses are dirty or scratched. Whatever the cause, rest assured that our experts can troubleshoot the problem to locate its source, and to then apply the appropriate fix. Our team believes that homeowners shouldn't have to wait to get help with anything involving their garage door or their automatic gate. If you find yourself dealing with some type of problem, whether it's damaged panels, bent tracks or opener chain failure, you can be certain that our experts are here to assist you. Contact Gate Repair Glendale today to get fast and effective help.